Jacksonville, FL: Warm weather, holiday weekend, and .... Raspberry Tart! They all go together. Thinking of things that go together, collaboration beers just may come to mind for many. 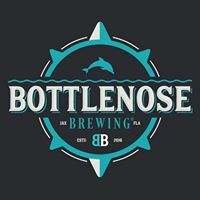 In a collaborative spirit among locals, Jacksonville breweries Bottlenose Brewing and Intuition Ale Works recently teamed up and brewed up ... a special batch of beer, a Raspberry Tart. On Saturday, September 2, the "fruits" of their efforts will be pouring from the taps at Bottlenose Brewing, 9700 Deer Lake Ct., in the Tinseltown area of Jacksonville's Southside district, beginning at 11am. As Bottlenose Brewing Head Brewer Chas Nemecek explains it, the Jacksonville craft beer and brewery scene is a "pretty tight knit group, and collaboration is about friendship." When Andrew Cattell, Head Brewer at Intuition, raised the idea of brewing a sour collaboration with him, Chas said, "it was a no-brainer." Because the brewhouse at Bottlenose Brewing is under construction, Chas and Andrew brewed the beer at Intuition's King Street facility. Chas is quick to point out that the brewing team at Intuition is made up of "amazing people." He describes the Raspberry Tart as a "light, tart table beer loaded with fresh raspberries. It's an easy-drinking session sour perfect for the hot weather." For those looking for some brewers' notes on the beer, Chas explains that it began as a kettle-soured red wort which had a light and tart taste before fermentation. After the beer was fermented with a Kolsch yeast, the brewers decided that raspberries would be the perfect complement. The result is a sessionable table beer at 3% ABV. The Raspberry Tart will be available on draft only at Bottlenose Brewing on Saturday, September 2. After that, it will also be on tap at Intuition Ale Works. To celebrate the collaboration and special release on September 2, Bottlenose Brewing will also offer several additional non-core Intuition beers: Silvertown Kentucky Common; A Gose by Any Other Name Lime Gose; Honey Badger Saison; and Ra, a dry-hopped and slightly sour Saison. Bottlenose Brewing opened in April, with 50 guest taps from local Jax area and Florida breweries, and a full kitchen. The brewery has been taking delivery on its brewhouse equipment, and its three-barrel brewing system is nearing completion. Once the last remaining piece arrives in late September, Chas will begin brewing house beers. Look for the first ones to be tapped in mid-October to early November. Intuition Ale Works opened its two-story facility on E. Bay Street just about a year ago. The brewery will hold its annual Oktoberfest celebration on Saturday, September 23. It will again host the Florida Brewers Guild annual Barrel-Aged, Cider and Sour Fest on November 11. Following that is the brewery's seventh Anniversary Week, with the annual Anniversary Bash on Saturday, November 18. Pretty exciting news for the Jax area craft beer community all the way around! Keep cool this weekend with a Raspberry Tart!